Heelbo® Foot Elevator/ Positioner. 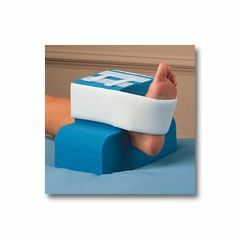 Wide base discourages internal/external hip rotation and maintains space between heel and bed, preventing skin breakdown on the heel. Dense polyurethane foam resists bottoming out. Permanently attached plantar straps secure foot position. Latex free. Sara: I will definitely recommend your company for their customer service - you went over and above with this one and I can't thank you enough!! I wanted to tell you that I am very impressed with your company. settled on yours though I hadn't yet heard of your company. The shipping cost was quite low for a mail order company, and the product arrived extremely promptly. The quality is fine. nature, we will certainly give Allegro Medical top priority.